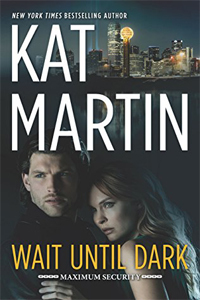 At 86 pages, Wait Until Dark is a quick read that introduces Kat Martin's upcoming Maximum Security romantic suspense series. As a prequel, it did its job, leaving me eagerly anticipating The Conspiracy, the first full-length book in the Maximum Security series, due to be released January 22, 2019. The suspense is intricately crafted, with plenty of twists and turns that kept me guessing, and changing my #1 suspects right up until the final reveal. The action is fast-paced and organic. The characters are interesting, pulling me into their world. What let me down was the romance. I just didn't buy the insta-lust and, especially, the insta-love that occurred so quickly. I also had a problem with the timing of the beginning of their physical relationship. I know events tend to move more quickly in a short novella but it didn't sit well with me, especially considering the trauma April had just been through. If this had been a longer book with time to sort out emotions, or an ending that left us with the possibility of a HEA rather than trying to tie up the happy ending with a pretty bow, I may have bought into their relationship with more confidence. While their romance left me wanting more depth, I liked both April and Jonah, enjoyed the action, the suspense, the challenge of trying to figure out the identity of the murderer, and the introduction to what looks to be another exciting series from Kat Martin. Happy November, PJ. This book sounds good.